Israeli police have shot dead a Palestinian motorist in East Jerusalem who they say tried to run over officers guarding the demolition of a home. The house belonged to a Palestinian man who killed three Israelis with a bulldozer last year. A police spokesman said officers shot the man after his car hit three guards, injuring them lightly. Police responded by firing more than 20 bullets into the windscreen, killing the man in Sur Baher village. Clashes erupted in the area after the shooting, as about 50 Palestinians threw stones at police, who fired back with tear gas and stun grenades. 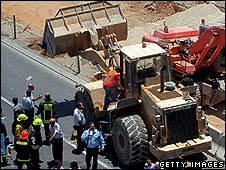 The house was pulled down after the Israeli Supreme Court rejected an appeal by the family of the attacker, Hussam Dwayat. Israel says the demolition of the homes of attackers is a deterrent. Last July, Dwayat used a bulldozer to smash into cars and a bus in central Jerusalem, killing three and injuring more than 40. The 30-year-old father of two carried out his attack on Jaffa Road, one of the city's main arteries, before an off-duty soldier shot him dead. The Israeli authorities have said that Dwayat acted alone and was not connected to any Palestinian militant group. Human-rights groups such as the Israeli group B'tselem have described the demolition of houses as "a clear case of collective punishment which violates the principle that a person is not to be punished for the acts of another". 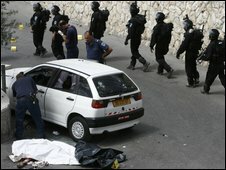 In 2005 an Israeli military commission concluded the policy of destroying a Palestinian attacker's home was ineffective as a deterrent and might encourage further attacks. Two other attacks by Palestinians using bulldozers have been carried out since Hussam Dwayat's death, though no Israelis were killed in these later incidents.